One of the contacts we have made in the area is Sue Gerrard, who educates her two children at home. 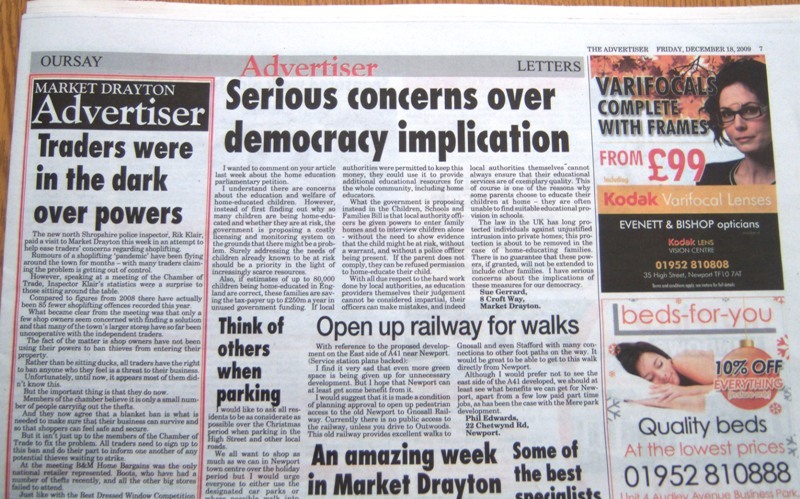 Sue said she would write to the Market Drayton Advertiser following the report published on 11 Dec. Here is her letter. I wanted to comment on your article last week about the home education parliamentary petition. I understand there are concerns about the education and welfare of home-educated children. However, instead of first finding out why so many children are being home-educated and whether they are at risk, the government is proposing a costly licensing and monitoring system on the grounds that there might be a problem. Surely addressing the needs of children already known to be at risk should be a priority in the light of increasingly scarce resources. Also, if estimates of up to 80,000 children being home-educated in England are correct, these families are saving the tax-payer up to £250m a year in unused government funding. If local authorities were permitted to keep this money, they could use it to provide additional educational resources for the whole community, including home educators. 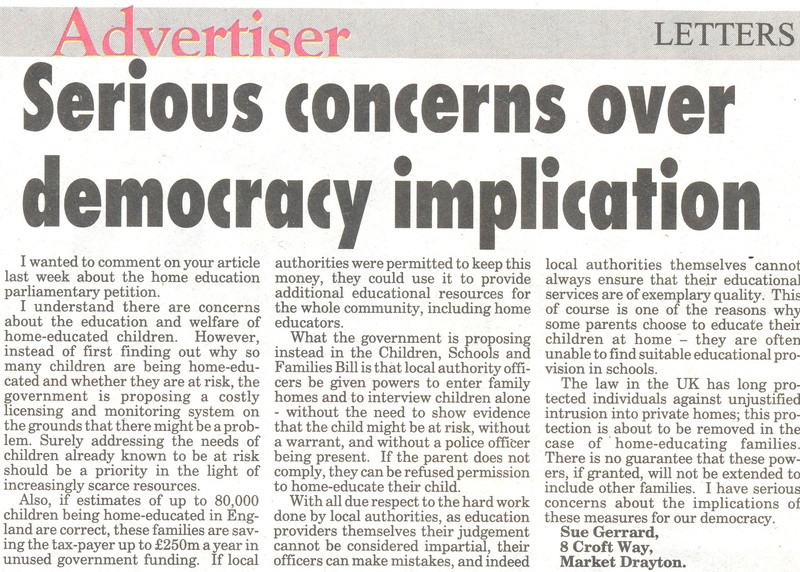 What the government is proposing instead in the Children, Schools and Families Bill is that local authority officers be given powers to enter family homes and to interview children alone – without the need to show evidence that the child might be at risk, without a warrant, and without a police officer being present. If the parent does not comply, they can be refused permission to home-educate their child. With all due respect to the hard work done by local authorities, as education providers themselves their judgment cannot be considered impartial, their officers can make mistakes, and indeed local authorities themselves – cannot always ensure that their educational services are of exemplary quality. This of course is one of the reasons why some parents choose to educate their children at home – they are often unable to find suitable educational provision in schools. The law in the UK has long protected individuals against unjustified intrusion into private homes; this protection is about to be removed in the case of’ home-educating families. There is no guarantee that these powers, if granted, will not be extended to include other families. I have serious concerns about the implications of these measures for our democracy.